I’m assuming the original concept for the shot was “hot shirtless guy just waking up rubbing his eye”, but the mechanics of a fashion shoot have produced an interesting, bizarre failure in the posing (although, I’m guessing this was likely deliberate, in which case, more power to the photographer, who’s uncredited of course). What results is an odd looking photo – a shirtless man, holding his fist very deliberately on his eye, staring at the camera. Instead of capturing a fairly involuntary gesture, it seems the image has confused the sign of this gesture with a random scattering of other signs associated with fashion photography – and more importantly, the sign of the fist, which seems to be lending a somewhat violent edge to the photo. So – just waking up, or a lazy effort to punch himself in the eye? good fun. From a few weeks ago, the only print I’ve really been satisfied with from the fashion shoot with Diana Scott (www.dianascottphotography.com). 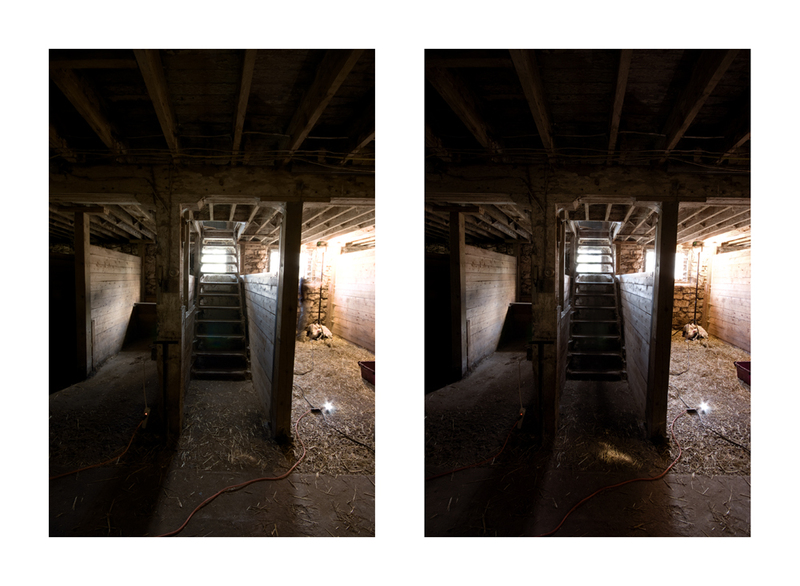 I seem to be drawing up a thread of “things below the surface” in my work lately, usually haunting or slightly malevolent; this work was about toying with the ideas of ghost photography and “repurposed” locations. There’s some thought in paranormal circles that renovation of haunted locales sometimes results in “increased activity”, I might play with this concept in terms of older locations that have been re-purposed or modified, the camera becoming the source of the “haunting”. Whether this concept will play out in terms of a series, I’m not really sure at this point; I’m not entirely convinced it’ll function as a one-off like it is now. Slowly but surely adding portfolio galleries to this thing, you’ll find links at right in the ‘pages’ section. Had a fun photoshoot with Diana Scott & Co. this past sunday, will post some results when I get it all sorted.